Located at the heart of Teluk Kumbar, Lexis Suites Penang is the sister property of Lexis Hibiscus at Port Dickson. The hotel greets each arriving guest with an impressive marble-tiled lobby. Fanciful chandeliers hang from the ceiling of the mezzanine. In the spirit of the impending Chinese New Year, the entrance is decorated with festive lanterns and cherry blossom. Roselle Coffee House is the flagship restaurant of the hotel. 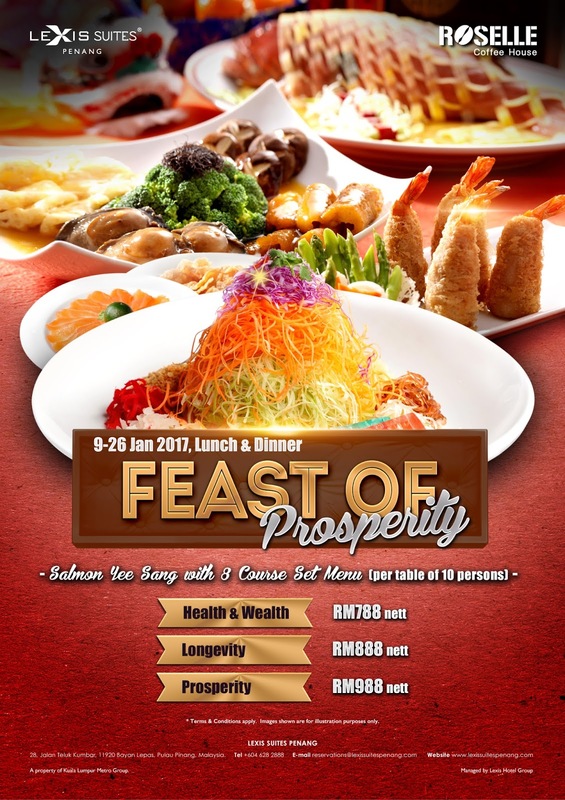 From 9 to 26 January 2017, the restaurant is offering Feast Of Prosperity banquet meals. Available for lunch and dinner, there are 3 choices of 8-course meals including salmon yee sang. Yee sang (鱼生) has become an integral element of Chinese New Year meals in Malaysia. "Yee sang" literally means "raw fish". Fish is considered auspicious because it symbolizes "abundance" (余). Besides raw salmon, Roselle's Prosperity Yee Sang Salmon Fish (鸿运七彩鱼生) also includes jellyfish, seaweed, crackers, daikon, carrots and five spice powder (五香粉). Lexis Suites Penang does not serve shark fin soup in line with the hotel's commitment to shark conservation efforts. Seafood Soup With Crab Meat & Dried Scallop (大展鸿图) is served instead. The thick soup contains a generous amount of scallops and crab meal, making it very flavorful indeed. The next dish is Crispy Golden Roasted Duck & Shredded Marinated Duck Meat (富甲在一方). One side of this dish is Chinese-style roasted duck, where its skin is delightfully waxy and crispy. The other half comprises of marinated duck slices served over a bed of jellyfish. Both versions of duck are enjoyable in their own right. Braised Sea Cucumber With Dried Oyster, Sea Moss, Flower Mushroom & Broccoli (财源滚滚来) is yet another interesting dish. One of its ingredients, fat choy (发菜), is considered auspicious because it sounds similar to "striking rich" (发财) in Chinese. However unlike Vistana's, fat choy in this dish has been assimilated into the gravy instead of being a distinct ingredient. I am impressed with the Stir Fried King Prawns With Spice & Pepper (彩龙喜迎春). The shrimps are plump and crunchy, making each bite a gratifying experience. There is no black "mass" in the shrimp heads either. This is a hallmark of absolute freshness. Also hailing from the marine kingdom, the Steamed Grouper With Supreme Soya Sauce With Roasted Garlic (一帆又风顺) is another dish not to be trifled with. Despite its fearsome appearance, the large grouper (石斑鱼) has pleasantly delicate flesh. The fish is served in soy sauce and garnished with coriander. If the banquet setting feels too rigid for your dining style, consider the Auspicious Buffet from 27 January 2017 to 3 February 2017. 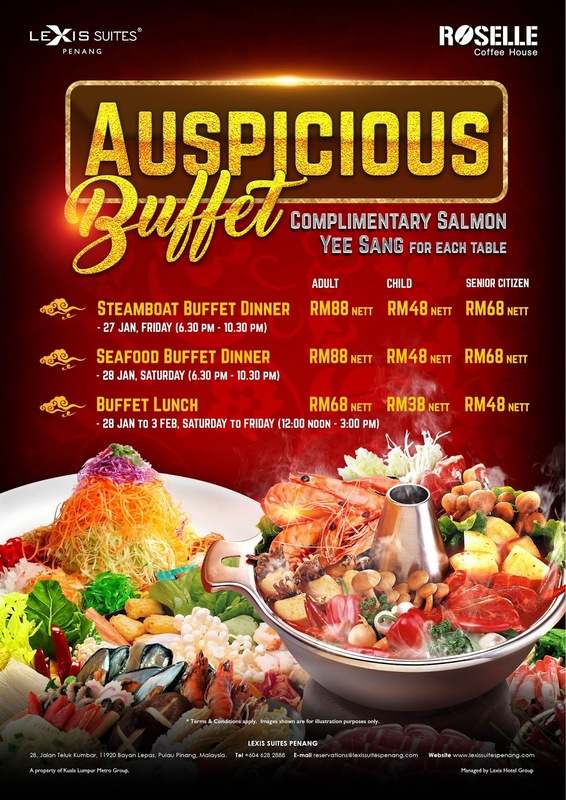 The buffet includes complimentary salmon yee sang at each table. For the best dining experience, catch the dinner session on Chinese New Year Eve (27 January 2017) because steamboat is also included in the buffet line-up. There are 5 types of soup such as chicken, fish, herbal, tom yum and Sichuan. Although each pot only holds 2 types of soup at a time, diners are free to switch to different types as frequently as desired. Seafood is an essential aspect of steamboat. There are various marine delicacies such as slipper lobsters (蝉虾), yabbies (淡水龙虾), white prawns (白虾), flower crabs (花蟹), razor clams (竹蚶), scallops (扇贝), clams (蛤蜊), cuttlefish (鱿鱼) and squids (墨鱼). As for fish, fresh grouper (石斑鱼), red snapper (红鱼), catfish (鲇鱼) and mackerel (鲭鱼) are all available. Starting January 2017, more seafood items are sourced from local fishermen of Teluk Kumbar. This is part of the hotel's commitment in supporting the local economy of this backwater village. There are also several types of beef, lamb and chicken to go with steamboat. I prefer the marinated ones as they are the most delectable. For example, bolder-flavored red meats go well with black pepper. Meanwhile, the more delicate chicken works better with turmeric (kunyit) marinade. Chicken does not need to be cooked as long as beef or lamb. Besides fresh meat, there are also various kinds of fish balls, prawn balls, meatballs, surimi, sausages and yong tau foo (酿豆腐). Several types of raw noodles are provided too. In addition, mushrooms like shimeji (占地) are great in contributing savoriness to the soup. Green vegetables include Chinese broccoli (芥兰), romaine lettuce (莴苣) and cabbage (卷心菜). It is wise to add vegetables to the soup early on because they help to impart some degree of sweetness. Meanwhile, lotus roots are special in the sense that they remain crunchy even after being boiled for some time. There are over a dozen types of sauces and condiments to enjoy with steamboat. Besides soup recipe, another way for steamboat restaurants to differentiate themselves from others is by their sauces. While waiting for the pot of soup to come to a boil, check out the range of cooked food too. A good place to start is the Lamb Leg Carving. The lamb is roasted till tender but still has some pinkish juiciness at the center. It is served with grilled vegetables such as bell peppers, carrots and onions. Another interesting dish is Ikan Bakar. The red snapper (红鱼) is carefully roasted such that its flesh remains reasonably tender. The fish goes well with sweet and sour sauce. Fans of Japanese cuisine can indulge themselves with fresh sashimi (刺身) and sushi (寿司). Fish used for sashimi are salmon (サーモン), tuna (マグロ), butterfish (白マグロ) and octopus (たこ). Sushi choices are mostly of maki (巻き) and nigiri (握り) types. 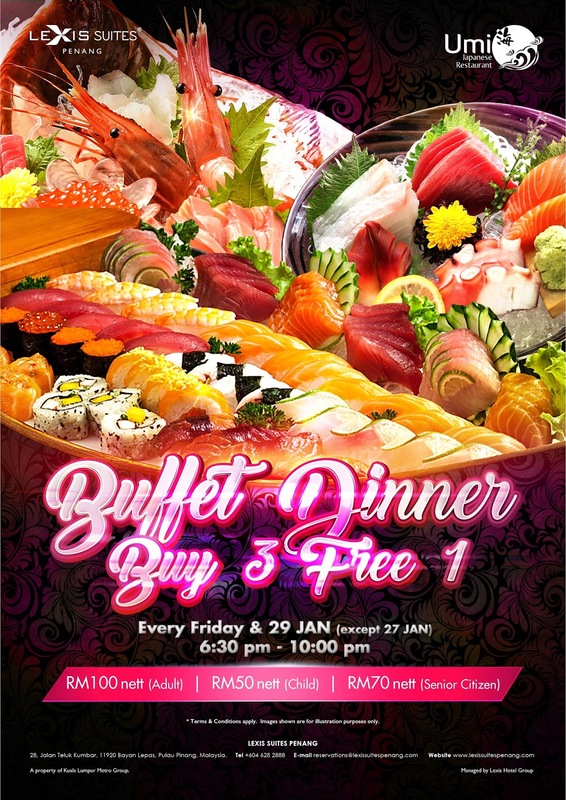 In fact, there are separate buffet sessions at Umi Japanese Restaurant on the ground floor. For a limited time, each party of 4 persons only need to pay the price of 3. Like my previous visit, the pastry section of Roselle has a wide range of delectable pastries such as sponge cakes, cheesecakes, petits fours, mousse, custards and jellies. Notably new during Chinese New Year are the fortune cookies (签语饼). One of my favorite desserts this evening is Strawberry Mousse Cake. I like the creamy consistency of the mousse that does not feel surfeiting. Meanwhile for cake decoration, white chocolate "coins" span the circumference of the cake. The pastry section also prepares a couple of sponge cake flavors. These fluffy treats are the perfect way to conclude a hearty meal. Since my previous visit, Roselle Coffee House has been halal-certified. 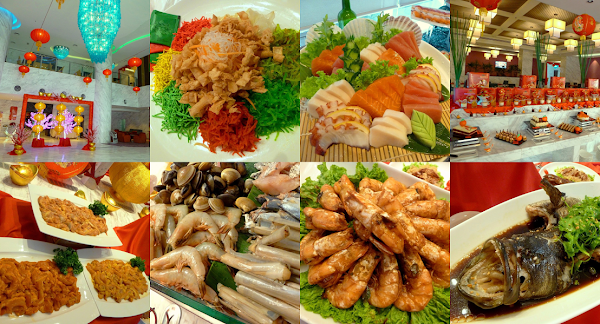 Therefore, Lexis Suites Penang's Chinese New Year banquet and buffet are excellent choices for hosting Chinese New Year celebration meals with coworkers and business partners.